Although Oasis' new album Dig Up Your Soul isn't officially available to buy until Monday, you can listen to the whole album now, via the band's MySpace page. 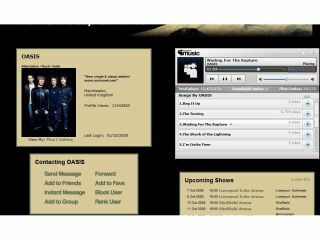 Obviously, this isn't the first time a band has premiered an album through the social-networking site, but it is the first time Oasis has dived feet first into the digital domain and chucked a whole album on the site for a listen. The actual homepage is all geared up for you actually purchasing the latest work, with a massive link to iTunes at the top - where you can purchase the single 'The Shock Of Lightning' - but scroll down and on the right-hand side, all the new tracks are available. It looks likely that MySpace will be premiering many more high-profile albums in the near future, with MySpace Music set to launch in the UK. The music service, which will offer streaming music and downloads, kicked off in the States just last week.